Would you like to add an image counter to your Envira Gallery lightbox? With Envira, it’s as easy as the click of a button for your gallery’s configuration. This tutorial will help show you how to add an image counter to your gallery lightbox. Why don’t I see the option on my Lightbox tab? Next, navigate to the Lightbox tab and select the Base (Dark) lightbox theme. Just check the box for the Enable Image Counter? And that’s it, you’re all done! Would you like to do the same for Envira Albums? Check out our tutorial on How To Add Image Counter to Album Lightbox. A: This option is currently only available with the Base (Dark) lightbox theme. 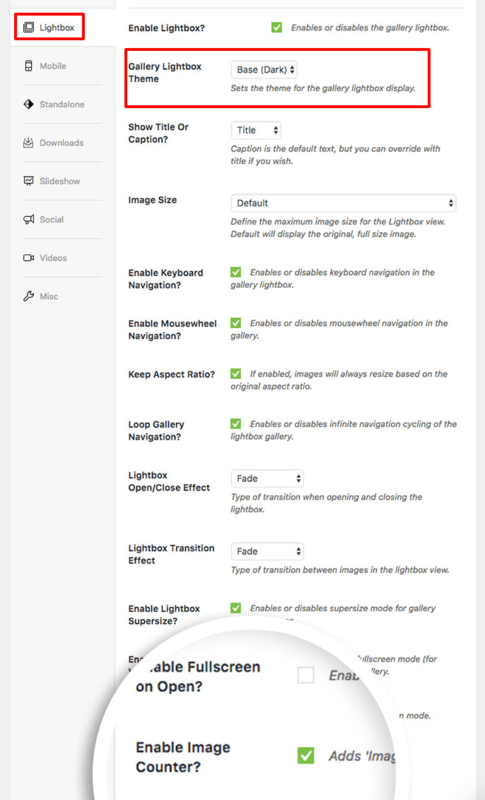 Please go to your Lightobx tab and make sure that your Lightbox theme matches the screenshot above.